1.Test the paint. Before removing any paint in structures built before 1978 (the year that lead-based paint was banned), test it for lead content by using a kit from your local paint store. If lead is found, then contact an EPA lead-safe certified contractor to undertake the removal in compliance with safety regulations. 2.Wear protective gear. 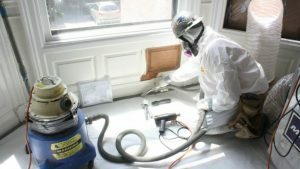 Remember to don chemical-resistant gloves, goggles, respirator, and long-sleeved clothing during the stripping process. And be sure to put down dropcloths to protect furniture, floors, and other surfaces. 3. Make the appropriate paint stripper selection. 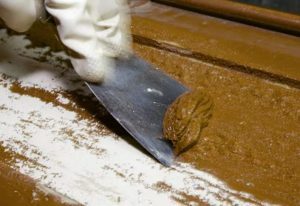 Base your decision on the type of coating you’re removing (e.g., latex or oil-based paint, stain, polyurethane, varnish, epoxy, or shellac), the approximate number of layers, the type of surface (e.g., masonry, wood, or metal), and sensitivity to odors or exposure to caustic chemicals (which might prompt you to use an eco-friendly safer stripper). Product labels can help you determine the appropriate product. When in doubt, consult a paint store expert. 4.Follow the directions. It’s also important to make sure the surface is clean before beginning; if you’re removing paint from metal, use a wire brush to get rid of loose paint or rust. Pour the stripper into a metal container or paint tray or a glass jar. (Don’t use plastic.) When removing a coating from a vertical surface, use a thick paste or gel product that will cling to the surface without dripping, and apply the product from the bottom up. Use a paintbrush or roller to apply the product, moving in one direction. Before stripping coatings from doors and cabinets, remove them from their hinges and lay the items flat. If using an aerosol or sprayable stripper, make sure to protect the area from overspray with a heavy plastic dropcloth. If you’re using these products outdoors, avoid working in breezy or windy conditions. Make sure you have the proper ventilation; if you’re working on a piece of furniture or a removable door, then take the project outside. Wait the appropriate amount of time (usually 15–30 minutes) before trying to remove the coating; depending on the surface, you’ll see the paint begin to buckle and wrinkle as a sign that it’s loosened. 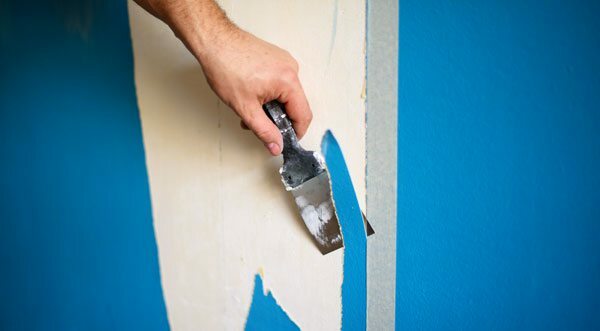 Use a putty knife to scrape away the soft or loosened coating. 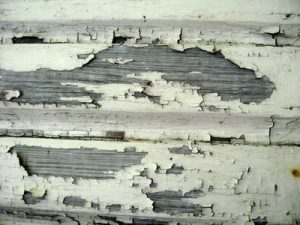 When removing paint from wood surfaces, be careful not to scrape too deeply, or you could gouge the wood. Sand the remaining paint off the surface; for larger surfaces, you might wish to use an orbital sander, but do so carefully to help prevent damage. 5.Wrap it up. Once the project is complete, clean the room of dust by sweeping and/or vacuuming. Dispose of dropcloths and residue properly.